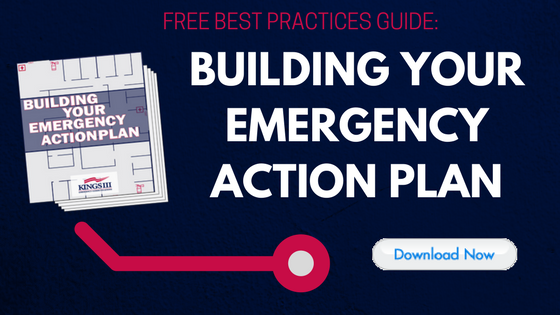 Behind the Scenes : Who Answers Your Emergency Phone ? Josh, Heidi and Jorge all regularly handle emergency phone calls made to Kings III. Learn more about what such an important job looks like from their end in this interview blog post. One of the facets of Kings III’s emergency response solution that is truly an asset and sets us apart from others like us is our monitoring service- how we actually handle and respond to your emergency phone calls. Our Emergency Dispatch Center (EDC) is staffed 24/7/365 with knowledgeable and helpful staff, trained and certified at a higher level than often even required in 911 emergency communications centers. Beyond certifications, we prioritize hiring upstanding, compassionate and caring operators who will go above and beyond what is expected of them to ensure that our emergency callers are in good hands. 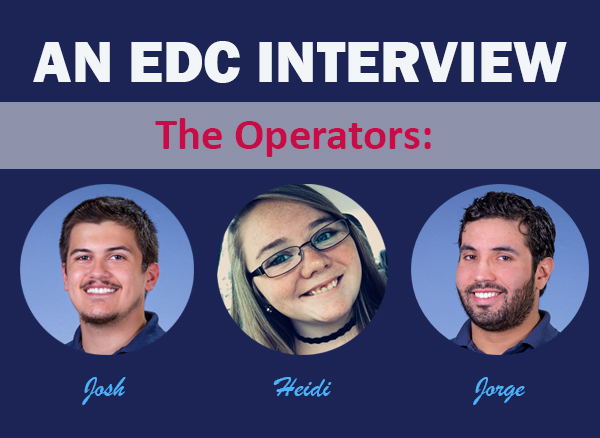 Don’t just take our word for it- see a more personal side of three of our EDC operators, Josh, Heidi and Jorge through this interview blog post. What do you think makes the EDC different from similar centers? Josh: I would argue that there are no similar centers to Kings III’s EDC. On any given day, Kings III can deal with a multitude of situations. We handle all sorts of residential and commercial property calls, including both quality assurance testing calls AND all calls of distress. When you think about it, that’s a pretty wide spectrum. Any one of our EDC operators can go from a routine test call right to handling a dire life safety call- like answering a mother who is screaming that her child has stopped breathing. After that, it could be an elevator entrapment. Our field is specialized, but it’s also diverse. I don’t know of any other similar center that is equipped to handle such a broad range of calls. Heidi: I think what makes the EDC different from other similar centers is the type of calls we take and the different levels of situations we have to deal with. We never know what’s going to be said when we answer these phones. We work together and are prepared for anything no matter how big or small the request may be. Jorge: In my experience, typically an emergency dispatch center that operates in the private sector seems to struggle with the balance of providing quality service to both their clients and their callers. Typically, centers like these can get caught up in trying to meet technical obligations to their client, such as code compliance and liability protection and what ends up happening in result is a more systematic, less specialized experience for the caller that can almost feel apathetic at times. While the client’s code compliance and liability protection remain a priority to Kings III, the policies that we have set in place and the people that are charged with enforcing them allow us to provide a setting where the interests of the client can be found in harmony with the needs of the caller. This truly sets us apart as an example. What is the craziest call that you have had to dispatch? Josh: The craziest call I have ever had to dispatch out to was an elevator entrapment in Los Angeles. There were FIFTEEN people in one elevator. What made this a particularly outstanding call was the effect of having such a large crowd. One man was unable to calm himself down, which angered some of the other passengers. During the time that they were waiting for the elevator company to come out, I got a call back from one of the passengers that a couple of the other passengers had started a fight with the man who wouldn’t calm down. Because of this, by the end of the call, we had the elevator technician, fire department, EMS and police all heading out to the site. Heidi: The very first time I worked the late night shift, I received a call around 3 am from a woman reporting that she had been sexually assaulted. During the time of the call, the person who I believed to have been to her assailant came to the phone and took her away. I dispatched police immediately. It was this call that really allowed me to realize how important it is for calls like this to be handled both quickly and effectively, when moments can truly make a difference. Jorge: That is a difficult question to answer. It honestly seems like every week brings a new craziest call title winner. Do I go with the gentleman who requested to be put in contact with the police because he did not have any food and then threatened to commit a crime if this issue was not resolved? I could also go with the time a bystander called to report that he had just witnessed a woman screaming for help from a balcony just before being dragged inside. Inherent to this position is the expectation that every call has the very real potential to become the next craziest. Josh: My favorite thing about my job is that we are in a position to make an immediate impact on any situation that comes my way. If someone’s life is in danger, as Kings III emergency communications operators, we are the first step in the direction of safety. If someone is stuck in an elevator, we are the first step in the direction of rescue. No matter what happens, whenever that button is pressed or phone is picked up, someone is coming from a place of need, and we are able to provide. Heidi: My favorite thing about this job is the feeling of accomplishment after you’ve had a difficult call knowing that you made an impact that was absolutely essential. You get that moment of relief knowing that you handled a tough situation in the best way possible, and it equips you with the confidence you will need for your next call and somebody else’s important situation. Jorge: There is a lot about this job that is worth mentioning. I love that it involves helping people in a very real and direct fashion. I sincerely appreciate the both professional and caring environment promoted by our management team. That being said, the greatest appeal for me lays in the mixed bag of problem solving opportunities I am presented with on a daily basis. I enjoy the unpredictability that comes with each phone call. Within the parameters set forth by Kings III and our clients, each phone call is a unique opportunity for creativity. Josh: The hardest thing about my job is that I don’t always get to know how an emergency situation ends. As a first responder, our job is to gather all of the information about a situation, dispatch out the appropriate help and stay on the line until that help arrives. However, once the emergency responders arrive, they assume the responsibility, and we must move on to our next call. Whether it’s an EMS dispatch with someone drowning (we stay on the line with the callers until the EMT’s arrive on scene, but we rarely find out the outcome), or a domestic disturbance in which you can hear the panic and shock in their voice, but they suddenly quit responding- all you can do is dispatch the police and pray that everything worked out. Heidi: The hardest thing I deal with the investment I begin to feel which each caller I come into contact with and their present scenario. I want to help as much as I can, but I am not there do physically do so. I find my peace in doing everything necessary to help and reassure them leading up to when the physical help does arrive. Jorge: I would have to say that the most difficult aspect of this job involves the limitations that come with not being physically present at the scene. There is a certain helplessness associated with being able to hear somebody in trouble, but not being present. I find it necessary sometimes to keep in mind that without me help might never come. As you can see, these emergency communications dispatchers really care about their job. We hope this gives you a better look at the kind of people that our EDC operators are and how we like to do business here at Kings III. We certainly feel privileged to have them on our team, representing us and our customers to those calling for help. For more information about our emergency communications services, visit www.kingsiii.com.